The cancellation must be done at least twenty days before the reservation date, if this time is exceeded, the group must be pay a 35% of the total. 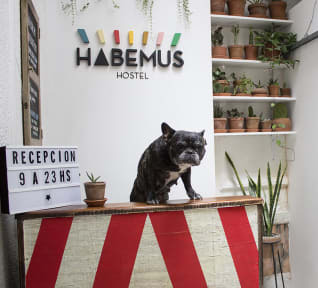 Habemus Hostel built to fulfil backpackers needs while offering unique decor and high-comfort. Kick back and enjoy an authentic stay at our freshly refurbished 1950´s house. In Montevideo´s hype Cordón area, where you are just steps away from all major attractions and interesting spots of the city, specially coffee shops, bars and restaurants. We will give you maps, information and recommendations on where to go. 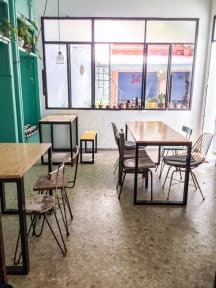 We love our cooking so we´ve fully renovated the kitchen so you feel comfy cooking way more than just instant noodles. By the way, we have a massive patio where we usually make (proper) asados and have a great time together. You can enjoy a fresh cuppa or cold brew in the shade of the avocado tree. In your dorm or private room you can expect to find a night stand, universal power socket, shelf space, hangers and a large locker for your valuables. All rooms are equipped with air-con, so don´t sweat about it. Showers and lavatories have been re-done from scratch and are kept very clean. The maximum period of stay is of 15 days.